Iranian workers make repairs to a unit at Tehran's oil refinery in November 2007. It's estimated that a Western oil embargo is costing Iran about $4.5 billion each month in lost revenue. The measures are intended to induce the Iranian government to accept restrictions on its nuclear program. Western governments worry that Iran may be intent on developing nuclear weapons, and they are prepared to intensify the economic squeeze until the government in Tehran agrees to open its nuclear facilities to international inspection and cut back on the enrichment of uranium. Few countries have experienced such intense external pressure. "The deeper the isolation of the Iranians, the more that we embargo broad sectors of their economy and their commerce, the more this starts to look like classic economic warfare," says Juan Zarate, who helped design early stages of the Iran sanctions as a Treasury Department official and deputy national security adviser under President George W. Bush. Not surprisingly, Tehran is pushing back. A group of Iranian parliamentarians this week drafted a bill to close the Strait of Hormuz to tankers carrying oil to countries that have sanctioned Iran. The Iranian Parliament has little power on its own, and the proposed action is seen as largely symbolic. One lawmaker was quoted as saying the bill was a reaction to the EU oil embargo, which took effect Sunday. Iran has been subject to Western sanctions for years, but in the beginning the measures were more limited, targeting particular entities and specific activities. Now, the U.S. and its allies are taking aim at the entire Iranian economy. "One of the things we are pursuing is a ratcheting up of the pressure on Iran," says David Cohen, undersecretary for terrorism and financial intelligence at the Treasury Department. "That means pursuing this program in a way that will have a broader impact on the economic situation in Iran." The sanctions are clearly hurting. 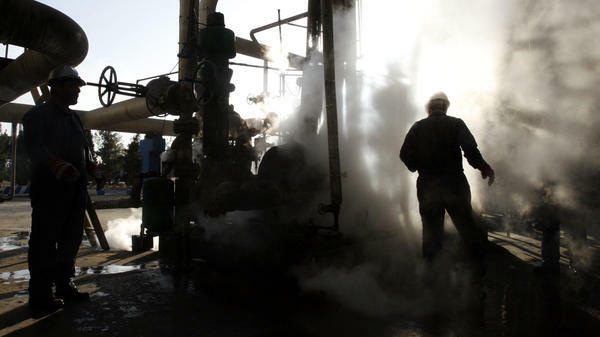 The oil embargo is believed to be costing Iran about $4.5 billion per month in lost revenue. High inflation — conservatively estimated by the government at 25 percent annually — is causing the price of imported items to skyrocket. The Iranian currency, the rial, has lost half its value in the past year, and there is little prospect of an improvement. In March, European governments pulled Iran out of the international bank messaging service known as SWIFT, effectively disconnecting Iranian banks from the rest of the international banking world. That step followed other measures that exposed foreign companies doing business with Iran to penalties. "Iran has been dependent on its commercial relationships, dependent on its trade with Europe and Asia," says Zarate, now a senior adviser at the Center for Strategic and International Studies. "That's why this matters to them." Whether the economic pain will prompt Iran's Supreme Leader Ali Khamenei to accept limits on his nuclear program is another question, however. The Treasury Department's Cohen thinks it might, pointing to Ayatollah Ruhollah Khomeini's 1988 acceptance of a cease-fire decision in the Iran-Iraq war. "The supreme leader agreed to end that conflict in part because of the economic situation at the time," Cohen says. "So we have reason to believe that we can achieve a political change in Iran's approach as a result of economic pressure." In addition, Cohen argues, the sanctions program can have an effect on Iran's nuclear program even without a change in Iranian thinking. "It also disrupts the ability of those actors who are trying to build Iran's nuclear program from doing their work," Cohen says. To the extent that sanctions make it more difficult or more costly for Iranian engineers to import the parts and equipment they need, progress on developing the country's nuclear program could be slowed. So, are sanctions working to make Iran less of a nuclear threat? "The regime has been bracing for this," says Mark Dubowitz, executive director of the Foundation for Defense of Democracies. "It has large foreign exchange reserves, and it is still earning $40 [billion] or $45 billion a year from oil sales. "The supreme leader's economic expiration date — when his cash hoard falls low enough to set off a massive economic panic — may still be far off," Dubowitz argues. "If the [Obama] administration wants to bring that date closer, it needs to make clear that the United States and our allies will do everything in their power to destroy Iran's energy wealth unless the regime compromises." If there is to be any sign of flexibility on the Iranian side, it is likely to come in the ongoing "P5+1" talks, with the five permanent members of the U.N. Security Council plus Germany. Those talks continue Tuesday in the Turkish city of Istanbul with a meeting of technical experts. Iran is once again threatening to block oil tankers moving through the Strait of Hormuz. The Iranian parliament says it's in response to the European Union's embargo on Iranian oil, which took effect on Sunday. Western governments want Iran to limit its nuclear program. NPR's Tom Gjelten says Iran is emerging as a test case for whether economic pressure can force a country to change its policies. TOM GJELTEN, BYLINE: Iran has been subject to Western sanctions for years. In the beginning, they were limited, targeting specific activities. No more. David Cohen, the Treasury Department's undersecretary for financial intelligence, says the U.S. and its allies now aim at the entire Iranian economy. DAVID COHEN: One of the things that we are pursuing is a ratcheting up of the pressure on Iran, and that means pursuing this program in a way that will have a broader impact on the economic situation in Iran. GJELTEN: The idea being that if the economic situation gets bad enough, the Iranian government will accept restrictions on its nuclear program. Oil is the basis of Iran's economy, and as of this week, European countries have halted the purchase of Iranian oil. As for countries that keep buying that oil, the United States is ready to deny them access to U.S. banks. And there's more. Juan Zarate, a sanctions expert at the Center for Strategic and International Studies, says the U.S. and its allies have identified Iran's choke points in the international financial system. JUAN ZARATE: So the Iranian banks have been a key focus, the insurance and reinsurance companies that allow for the shipping that is so important and critical for Iran - not just with its exports, but also its gas imports. GJELTEN: And finally, blocking investment activity so Iran can't develop its oil industry. Zarate, who served at both the Treasury Department and the National Security Council under President Bush, says the sanctions program can now be considered a major foreign policy tool, rivaling diplomacy and military force in its intended effect on Iran. ZARATE: The deeper the isolation of the Iranians, the more that we embargo broad sets of their economy and their commerce, the more that starts to look like classic economic warfare. GJELTEN: The U.S. and its allies now engaged in economic warfare against Iran, and with devastating effect. About four-and-a-half billion dollars a month in lost oil revenue, inflation of at least 25 percent a year, just by the Iranian government's estimate, the Iranian currency losing half its value. So will this pain cause Iran's supreme leader, Ali Khamenei, to accept limits on his nuclear program? The Treasury Department's David Cohen points to the resolution of the Iran-Iraq war. COHEN: The supreme leader agreed to ending that conflict in part because of the economic situation at the time. So we have reason to believe that we can achieve a political change in Iran's approach as a result of economic pressure. GJELTEN: Plus, Cohen says, the sanctions regime can have an effect above and beyond its impact on Iranian thinking about the nuclear program. It can slow progress on that program just by making it harder for the Iranians to import the parts they need. MARK DUBOWITZ: It disrupts the ability of those actors who are trying to build Iran's nuclear program from being to do their work. GJELTEN: So, are sanctions working to make Iran less of a nuclear threat? Mark Dubowitz of the Foundation for the Defense of Democracies says the regime still has abundant foreign reserves, and while its oil revenue is down, it's still making a lot of money. DUBOWITZ: The supreme leader's economic expiration date, you know, when his cash hoard falls low enough to set off a massive economic panic, may still be far off. And if the administration wants to bring that date closer, it needs to make it clear the administration and our allies will do everything in our power to destroy Iran's energy wealth unless the regime compromises. GJELTEN: Obama administration officials say there is one sign Iran is feeling some pressure: its relatively new willingness at least to discuss its nuclear program with the five permanent U.N. Security Council members plus Germany. Those talks continue today in Istanbul with a meeting of technical experts.